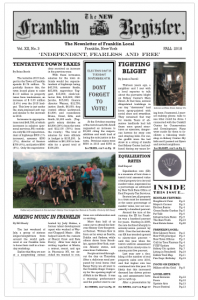 Download a PDF copy of the New Franklin Register Issue #36 (11 MB) by clicking on the image. See the index of this issue, and links to all previous issues, on the index page. The Sidney Center Improvement Group (SCIG) is a 501(c)(3) registered non-profit organization formed over ten years ago with one basic idea – getting people together to clean up Sidney Center. We’ve come a long way since then. As volunteers working together, our mission is to improve the quality of life for those living in and around the hamlet of Sidney Center. To further this mission, SCIG focuses on three areas: free community events, clean water education and outreach, and beautification and improvement projects. All these share the common goal of promoting a healthy Upstate NY lifestyle and helping to change local attitudes about realizing the renewed potential of our area when it’s supported by meaningful progress. Over the next few issues of The New Franklin Register, I will outline each focus area with fewer words and more pictures, in order to show the results of our work to the community and to the next generation, who we hope will either stay or return to this area. Because beautification and general improvement was the Group’s founding motivation, it seems like a natural place to start. For many years, SCIG has maintained over thirty flower barrels and several large planters, one of which holds the community announcement sign. These were initially purchased with a grant the Group received. Every year, flowers are planted and maintained by volunteers. One can drive through the hamlet and not only see the beautiful flowers but also the lively insects that inhabit these barrels. These cheerful bugs were constructed and hand-painted by volunteers, adding a unique piece of art to each barrel. Another project, years in the making, has been to restore and improve the hamlet entrance signs. At the start of last winter, the signs were taken down and reconstructed, with care taken to help the signs withstand the elements for years to come. This will not only the enhance the curb appeal of Sidney Center, but also remind motorists that they’re entering a small hamlet, so please drive slowly. Finally, as has been written about in previous issues, the Sidney Center Park & Playground is in the process of being restored. This is a larger effort with multiple parties involved. The success of SCIG over the years can be attributed to the partnerships created to accomplish these tasks. This spring, SCIG received a donation of approximately 200 trees from NYSEG’s Vegetation Management Department. These were given out to the public for free, and a couple dozen were planted in the park. SCIG is an all-volunteer organization, therefore the success of these projects is contingent on support from members, friends, local leaders, town & county departments, and folks from the community. We are funded entirely through donations, grants acquired for specific projects, and fundraising events. With any volunteer organization, it takes time to accomplish tasks. SCIG appreciates everyone’s patience and understanding while we make progress in Sidney Center. SCIG is always looking for new, fresh ideas and perspectives. Volunteers are always appreciated so if you’d like to help in our effort to make Sidney Center a nicer place to live, please consider attending a meeting, which are always open to the public. SCIG meets the 2nd Tuesday of every month at 6:30pm at the Sidney Center Fire Hall, unless our facebook page states otherwise. To learn more visit: www.facebook.com/SCIGNY or www.SCIGNY.org. Many people worry about the cost of their own healthcare, but local business owners also worry about their employees. Health coverage is particularly important for local farmers, well aware of their work’s physical dangers (https://goo.gl/hGXYKT). These and other small business owners in Delaware County support the New York Health Act, state legislation that would cover all healthcare for New York residents. According to the grassroots Campaign for New York Health (NYHCampaign.org), the bill would eliminate networks, deductibles, copays, and insurance companies. All medically necessary care (including vision, dental, prescriptions, and devices like dentures and hearing aids) would be covered, as determined by your primary care physician. 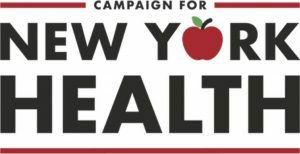 NY Health has gained momentum alongside calls for national Medicare for All. The bill (A4738/ S4840) passed the state Assembly on June 14 for the fourth year straight but needs one co-sponsor for a Senate majority. Senator Seward, who chairs the Insurance Committee, is not a co-sponsor. NY Health will be financed through a progressive payroll tax with employers paying eighty percent and employees twenty percent, and a similar tax on capital gains for upper incomes. Those making under $25,000 a year would pay nothing, according to an analysis by economics professor Gerald Friedman (https://goo.gl/MWq3Rd). For those making $50,000, healthcare would cost employer and employee a total of $2,250 a year, and for those making $75,000, it would cost $5,000. This tax would replace premiums, deductibles, and copays, and would cover all dependents. Friedman concludes that costs will be this low, even after expanding coverage, because single-payer NY Health will reduce administrative complexity and begin negotiating drug prices. Currently, businesses pay a lot more. According to last year’s Kaiser Employer Health Benefits survey, 2017 premiums for family coverage increased to $17,615 for an average small business worker, with employer paying sixty percent and employee forty percent (https://goo.gl/yNrTP8). For local businesses with thin profit margins, this cost is daunting. The median weekly wage in Delaware County is $820 (goo.gl/B5qC6K). Do the math: family health benefits add twenty-five percent to labor costs at an average Delaware County small business. Such costs can force an impossible choice: go without health coverage, or go out of business. Pam Gueldner, who owns a food service business in Ithaca with forty employees, wishes she could provide health benefits for herself and her employees. Even when businesses provide insurance, insurance covers less each year. Deductibles now average above $2,000 for small business employees, according to the Kaiser survey. Even insured people avoid getting necessary care, making them sicker and less productive at work. NY Health will eliminate deductibles and other financial obstacles to care. By providing health coverage for everyone, supporters argue, NY Health would encourage entrepreneurs to start businesses without fear of losing coverage. NY Health ties coverage costs to workers’ income, easing the relative burden of healthcare costs on low-margin businesses. It also eliminates the time businesses spend to administer health plans, allowing them to focus on growth. Meanwhile, according to Friedman, the savings from reducing people’s healthcare costs statewide will pump money into New York’s economy and create around 200,000 new jobs, many of them in small businesses glad to have comprehensive, affordable healthcare. Small businesses may not earn big profits, but they drive our economy. Sarah Outterson-Murphy lives in Delhi, parents two small children, and teaches English part-time. Like many of us, the famous photographer and American Progressive Lewis Hine visited Franklin and fell in love with the beauty of the landscape. Timothy J. Duerden has written his biography. Duerden is the director of the Delaware Historical Association in Delhi, NY, and is an adjunct lecturer in history at the State University of New York, Oneonta. He has edited, written or co-written six books about Delaware County, but this book was more personal. Duerden lives in Franklin and wanted to share the story of a well-known person associated with our town. 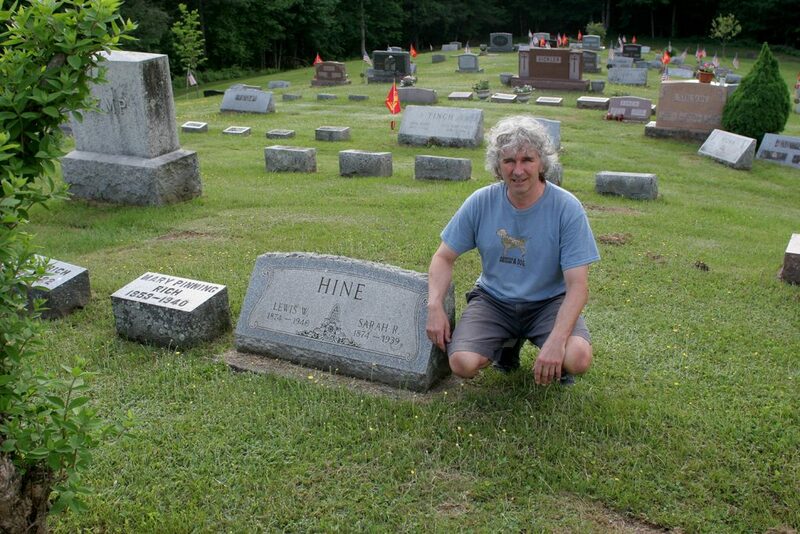 Hine is buried in the Ouleout Valley Cemetery.